I’m always on the lookout for something that helps with comprehension…any kind of comprehension. Or Fluency… When I find an app that I can use for both, I’m ecstatic. Granted, that doesn’t happen very often. I should say the biggest reason I downloaded it (at first) was because Eric Sailors created it and I have an immense respect for him. Imagine my pleasant surprise when the app was even better than I had thought it would be. The app costs $14.99. Which, when compared to some apps is a bit high…but sometimes we really do get what we pay for. In this case, $14.99 gives me 24 stories, with quizzes, and data…AND…it gives me the opportunity to create new stories and download stories other people have created. The app is nearly endless. The stories are not too short – but not too long. Typically they are a full-page plus a bit more (usually several paragraphs). On the left side of each story is a picture. Each picture has animations that occur when tapped in the correct spots. While this doesn’t add to the content, it does give the opportunity to use prediction to guess what the story is about. 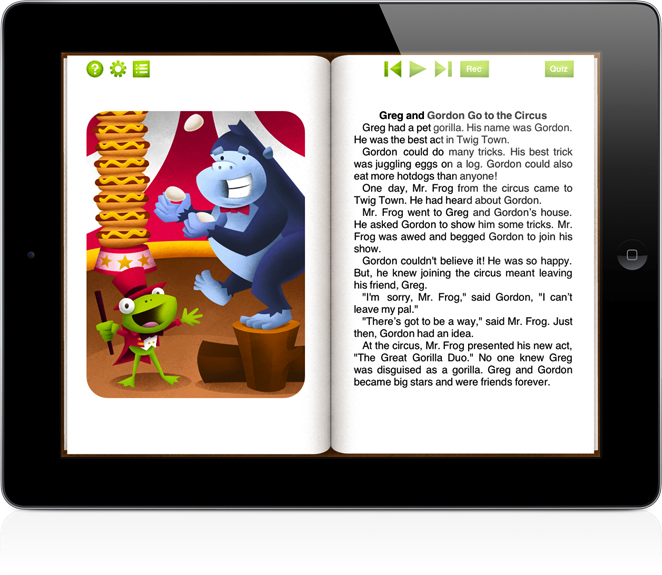 The app allows the user to either read the story themselves, or, have the story narrated. On the iTunes website, one review states the narration is “automated” and very poor. I’m happy to report this is not the case now. I’m not sure if it was an update or what, but the narration now is very good. The narration on the quiz is a bit more automated, but fairly easy to understand. If you tap on the question in the quiz, the app will read the question. Tapping on each supplied answer will read the answer. When you tap next – it will score the question as either right or wrong. A correct answer has a happy little chime that sounds and displays a “thumbs up” by the selected answer. The wrong answer has a sad popping sound and displays a “thumbs up” by the correct question. Oh, an added bonus? The quizzes can be taken by multiple students. One feature that is nice, and not really obvious, is the narrative task-bar. Yes, of course it has the “play” feature. The voice that is heard is dependent on the buttons that are showing (and this is all explained in the tutorial on the app). If the narrative task-bar shows the symbols for “rewind,” “play,” and “fast-forward” followed by a button for TTS…the fast-forward button moves to the end of the story…and the voice is a full of inflection. If you tape on the TTS, the recorder “flips” (and that TTS button changes to Rec). Then the voice becomes more automated and robot-like. There’s actually a nice feature with this in that the program highlights the words as they are being read. When you hit the fast-forward symbol in this mode, it moves to the next sentence. The data is nice. I can click on the student’s name and I see all the quizzes they’ve taken. It gives me both the date and the story. Then it breaks down by the type of “WH” question. There’s also a spot for notes (which I use for noting how many cues were needed, etc.). If I want, I can email the results of the quizzes. Uhm…there’s the obvious reading comprehension…or auditory comprehension. There’s also reading fluency or even just plain fluency. If I have a school-age student who stutters, I may use this as a way to work on fluency. I’ve used it to discuss emotions and right/wrong situations at times. I wouldn’t say it’s a strong therapy tool for this use, but it was definitely an interesting one. I like that I can work on multiple goals at the same time. The app has some wonderful stories…but they are definitely for the younger crowd. While it works great for kids up to 3rd (maybe 4th) grade, it’s a bit immature for older kids. It would be wonderful to have the ability to divide stories by age/grade and have pre-school, 1-2, 3-4, etc. All in all…I think this is a nice solid app for the price. It’s one that I will definitely use a fair amount in my practice. Have any of you tried Story Pals? What did you think of it? Do you have a different auditory/reading comprehension app that you use? If so, please – drop me a note here.